On April 11, the New Hampshire Senate voted 17-6 to repeal the death penalty. With the House passing an identical version of the bill, House Bill 455, last month in a vote of 279-88, the legislature has the necessary two-thirds majority to override a potential veto from Gov. Chris Sununu (R). In an effort to initiate a campus-wide discussion on sexual violence, the Student and Presidential Committee on Sexual Assault will lead the College’s annual Take Back the Night March and Night of Reflection on the evening of April 26. 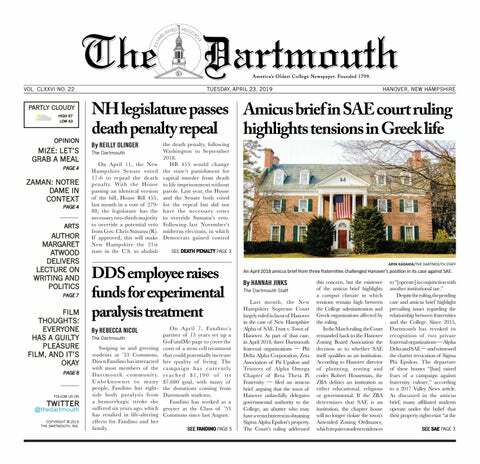 An “unlimited swipes” meal plan will replace Dartmouth Dining Services’ Ivy Standard Plan ­— which allows 28 swipes a week — in the fall of 2019.